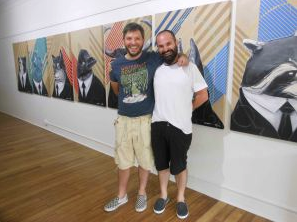 Revealing what’s hot in contemporary art has been the real deal for Newcastle’s Curve Gallery. This month is no exception. 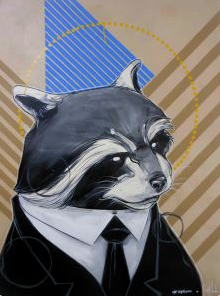 Bringing together the urban contemporary artists M-lon, Graphico & Apeseven keeps that upbeat vigour rollicking along. Transporting street art into exhibition spaces is pretty darn impressive so to see eight large canvases all adept and wildly meshed out is charming. Miguel Gonzalez aka M-lon sneaks some wild looking heads onto suits that trip the light fantastic with their anthropomorphic expressions. Backgrounds by Juan Vivas aka Graphico are sharp with graphic symbolism working well with the detailed foreground. “Miss Zebra, Dressed and Rowdy” is a stunner with her zebra stripes absorbing background graphics. Amazing as these canvases are the real stand out in the gallery space is the ephemeral wall piece incorporating the talent of both the artists M-lon and Graphico with the addition of street artist George Hambov aka Apeseven. 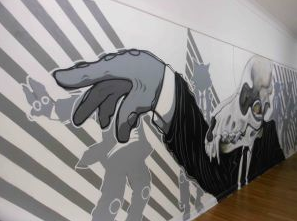 It’s in this collaboration that graffiti art can truly be recognised as a stand alone genre. The easy ambivalence Apeseven achieves is contrary for while his technique appears fresh and relaxed his images dominate and thrive. 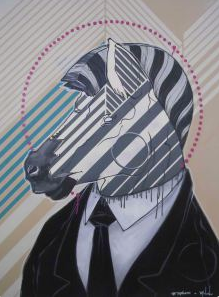 In this collaboration the individual styles of the three artists are easily identified. What’s great about this form of art is the lack of pretension involved. These fellas make art knowing it’s momentary and with a society based on the tangible it’s refreshing. Curve Gallery exhibits iDENTITY until 15th November.